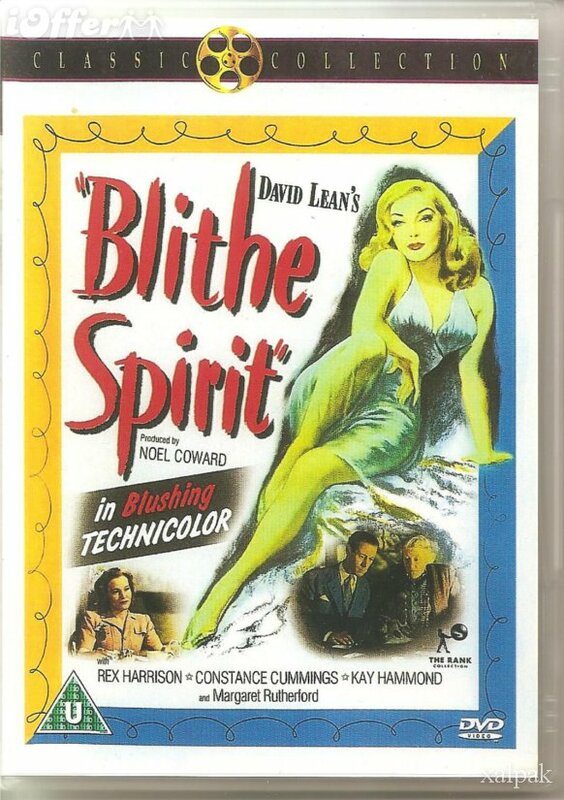 Tonight's movie was BLITHE SPIRIT, David Lean's filming of the Noel Coward play, starring Rex Harrison, Constance Cummings, Kay Hammond, and Margaret Rutherford. 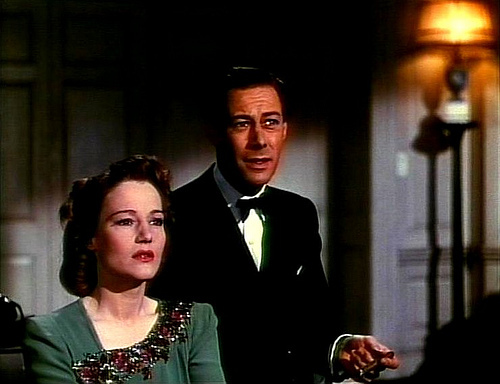 Charles Condomine (Harrison) has been married to Ruth (Cummings) for five years, after being widowed by the death of his first wife, Elvira (Hammond). Charles is a mystery writer, and he invites a medium, Madame Arcati (Rutherford), to conduct a seance at his home so that he can take notes for an upcoming writing project. Charles is flabbergasted when Madame Arcati conjures up Elvira's ghost. Ruth is at first hurt and confused by her husband's bizarre one-sided conversations, since she can't see Elvira, but she ultimately believes Charles is telling the truth. The Condomines ask Madame Arcati to send the mischievous Elvira back from whence she came, but find that may be easier said than done -- especially as it seems Elvira wants to take Charles back with her! This is a bright filming of Coward's play, with Harrison in fine form and truly impressive Oscar-winning special effects -- all the more effective as the film is in Technicolor. Although the film was well made and I'm glad I saw it, I can't say I'd be in a great hurry to see it again. Rutherford plays her role with gusto and good humor, but after a while Madame Arcati's schtick gets old, and the two squabbling, petulant wives become tiresome. There's some witty dialogue, as one might expect, but there's no character development to speak of, and the story becomes repetitive. The movie reminded me a bit of TOPPER (1937), with trouble-making Elvira calling to mind meddling Marion Kirby (Constance Bennett) of the earlier film; cars are also a significant plot device in both movies. It's also rather interesting to note that just a couple of years later Rex Harrison would play a ghost himself when he starred in the classic THE GHOST AND MRS. MUIR (1947). 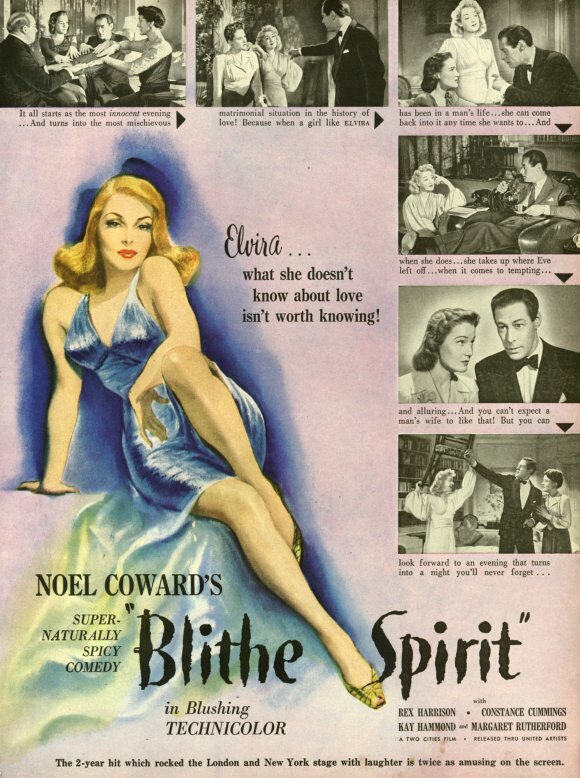 BLITHE SPIRIT's cinematography was by Ronald Neame, who also cowrote the adaptation of the play with David Lean and Anthony Havelock-Allan. Neame, a true Renaissance man of filmmaking, passed away last June at the age of 99. The movie runs 96 minutes. The supporting cast includes Joyce Carey, Hugh Wakefield, and Jacqueline Clarke, who repeated her role from the Broadway production. We watched Blithe Spirit via Netflix streaming, using our brand-new Roku. The movie has been released in various formats, including a Region 1 DVD, which is no longer in print, and a Region 2 DVD. It's also had multiple VHS releases.